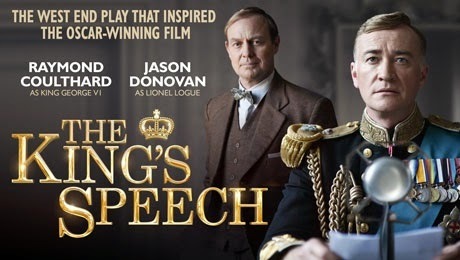 The King’s Speech – the play from which the Oscar-winning movie that starred Colin Firth and Geoffrey Rush was adapted – will set out on its first national tour in 2015. Starring Raymond Coulthard as King George VI and Jason Donovan as his Australian speech therapist Lionel Logue, the production will be supported by a fine acting company under the direction of Birmingham Rep’s Artistic Director Roxana Silbert. The UK tour opens at Chichester Festival Theatre on Thursday 5 February 2015, before coming to the Theatre Royal Glasgow on Monday 16 March for one week only. The play tells the iconic story of King George VI’s relationship with his speech therapist, as the country stands on the brink of World War II. It enjoyed an acclaimed West End season in 2012. 1936: King Edward VIII has abdicated for the love of Wallis Simpson. Bertie, his brother, is crowned King George VI of England. At an office in Harley Street in London, Bertie and his wife Elizabeth (the future much-loved Queen Mother) are meeting Australian maverick speech therapist and failed actor, Lionel Logue. With the support of his wife, Bertie and Logue embark on an extraordinary journey to overcome his stammer and deliver the now iconic speech broadcast across the globe to inspire his people. As the world stood against the Nazi threat, The King’s Speech is the true and heart-warming story of a greatly loved royal family who took this nation through its darkest hour.